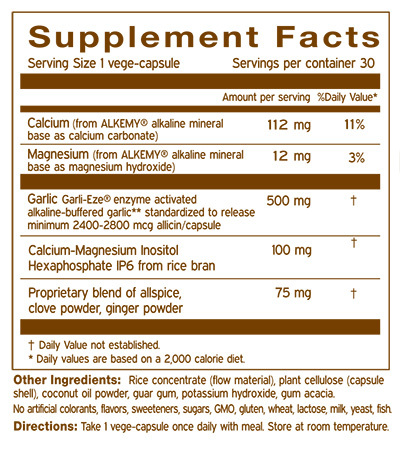 Uniquely preserves allinase, the enzyme that activates allicin, the primary active ingredient in fresh-crushed garlic, via provision of acid-neutralizing alkaline minerals (AlkemyTM). Proven in a human study to produce real allicin, just like a fresh-crushed clove of garlic, but without pungency (Garli-EzeTM) or odor. There is no other garlic pill like it. While other garlic pills falsely claim they provide allicin, only Enzyme Activated AllicinTM has been demonstrated to do this. Other brands test their garlic powders in water rather than an acidic environment (acetic acid- vinegar) that simulates the acidic environment in the stomach. Only Enzyme Activated Allicin TM protects allinase from destruction by stomach acid so that real allicin can be produced. Activates transient production of hydrogen sulfide gas that then triggers the production of defensive endogenous (internal) antioxidants — namely glutathione, catalase, superoxide dismutase, heme oxygenase via the Nrf2 gene transcription factor. Provides allithiamine, a potent and highly bioavailable form of vitamin B1. Provided in a companion base of potent herbs known for their germicidal properties (cloves, allspice and ginger and rice bran extract). No GMO, no gluten, no sugars, no preservatives, no colorants. Falkenberg, R and Archibald, H. Food Safety & Process Technology, Turlock, CA. Preface: Allicin, the primary active ingredient of garlic, is produced from fresh-crushed garlic capsules by the mixture of compartments within the garlic clove that blend alliin with allinase, the latter being the enzyme that activates allicin. However, allicin is quite pungent and difficult to swallow, being a throat irritant, and can be quite irritating to the gastric lining. The advantage of a patented alkaline-buffered garlic powder (Garli-EzeTM) has been demonstrated and is described below. Most garlic powders test for allicin yield in a neutral water bath that does not simulate the acidic environment (pH ~2-4) in the human stomach. When tested in an acid bath (acetic acid- vinegar), the allicin-activating enzyme allinase is destroyed and no allicin is produced. 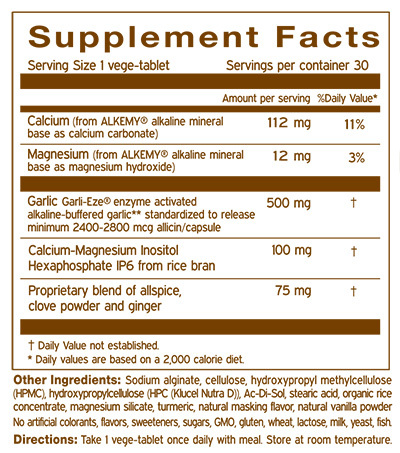 Label claims that other garlic powders offer “allicin yield” or “pure allicin powder” are specious and frankly represent deceptive mislabeling. Allicin is not produced until allinase is blended with allliin to produce allicin. This presumably occurs in the stomach but is negated by stomach acid. Possibly a small (trivial) amount of allicin is produced in some so-called stabilized garlic powders (~25 micrograms), whereas a fresh-crushed garlic clove produces 2400-2800 micrograms (2.4-2.8 milligrams) of allicin. The mechanism of garlic powders to produce significant amounts of allicin upon disintegration in the stomach has not been previously demonstrated. Some garlic capsules are enterically coated in an attempt to open the capsule in the less-acidic intestinal tract, but these capsules may pass all the way through the digestive tract without opening and may not always be reliable. Since blood levels of allicin cannot be measured, we assessed allicin bioavailability after garlic ingestion using breath analysis of allyl methyl sulfide (AMS), the primary allicin metabolite, employing a special alkaline buffered matrix (Alkemy TM). We compared the allicin bioavailability of a buffered garlic product (BGz; Garli-Eze®, Scientific Food Solutions, Fairfield, CA) to a non-buffered form (NBG), both delivered in non-enteric coated capsules containing 600 mg of garlic powder. Low-protein meal + non-buffered garlic = (51%). These data suggest that a buffered matrix augments the delivery and/or bioavailability of allicin, which also appears to operate independent of the buffering load of a protein-rich meal. Unlike common garlic powders, Garli-Eze TM garlic powder is derived from high-allicin (rich in alliin) garlic that is produced by a special growing process called mira-stemming.